This simple kit will allow you to connect a second interior antenna to an existing wireless repeater system. Please note that by adding an additional antenna, the coverage provided by the original antenna will be reduced as the 1) the signal will now be split between the two antennas and 2) you are adding more cable (loss) into the system. In order to maximize coverage try to minimize the length of the cable extensions. To connect to a Digital Antenna repeater you will need an RFU-620 adapter. We also have 3 and 4 way splitters available. Please contact us if you require more interior antennas. 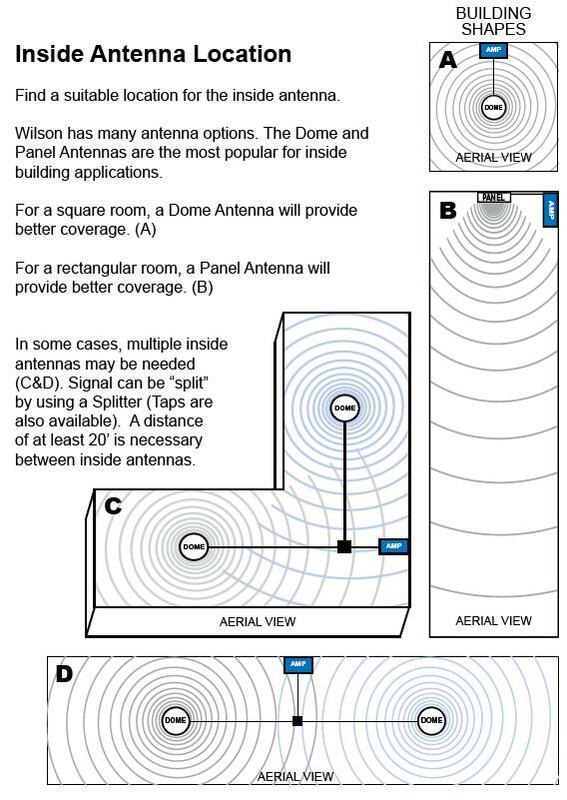 Interior Antenna: 301121WPS Dual-Band (Multi-Band) Ceiling Mount dome antenna, 301121 - Wilson Cellular Dome (Ceiling Mount) Antenna, or 301135 - Wilson Cellular Panel (Wall Mount) Antenna The 301121 dome is most commonly used. Example usage. To add the second antenna to your system, you'll need to remove the existing interior antenna and interior antenna cable. The splitter will be connected to the amplifier using one section of new LMR-400 cabling. The new antenna will be connected to the splitter using the other new section of LMR-cabling. Lastly, the original interior antenna and cable can be connected to the splitter.